I’m hoping the Democrat convention will be a fiasco, and if the die-hard supporters of the Wicked Witch of the East have anything to say about it, it will be. “WASHINGTON — A massive e-mail and Internet campaign is under way aimed at derailing the nomination of Barack Obama and making Hillary Clinton the Democratic Party’s standard bearer next week at the national convention in Denver. I hope this gets uglier than Hillary herself. I’m sure we’ve all seen this, but it’s cool. CAUGHT YOUTHENING: If John Edwards Fred Thompson did this, people would make fun of him. In a new campaign ad, the 60-year-old Hillary Clinton manages to lament the last seven years of the Bush Administration without looking as if she’s lived through it yet. The wrinkles are gone, thanks to a blurry, soft-focus video technique patented by Barbara Walters (who hosts The View every day as if she is still alive). 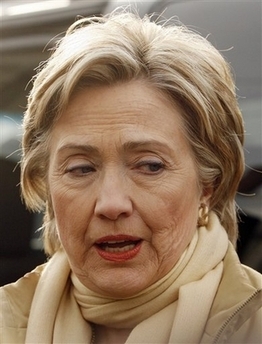 Hillary may protest when she’s accused of playing the gender card, but would a male candidate get away with going to such extraordinary lengths to look young?